We can create bespoke badges for personal use or multiple badges for large organisations to identify key personnel, ideal for corporate and charity functions exhibitions and conferences. 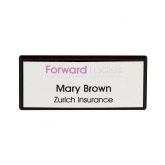 We manufacture badges for a range of organisations where key employees need to be identified - nursing homes, hospitals, doctors and dental surgeries, hotel and office receptionists, security and retail personnel. We have a standard range of badges which are set inside a frame with a pin fastening along with bespoke badges made with magnetic clips and pin fasteners. These can be produced in any shape and size in a variety of colours.